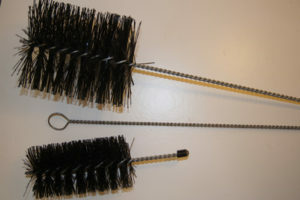 Use for traditional sweeping of chimneys up to 36″ in diameter. 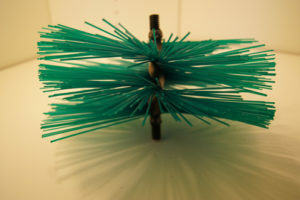 Made with polypropylene bristles densely packed and glued within the spiral to give additional strength and durability. 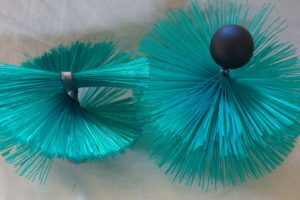 Threaded both ends to enable wear and tear to be spread by reversing the ball and adapter. Centre is approximately 5″. Comes standard with 1/2″ BSW threads to fit either Universal or Lockfast adapters on one end and a ball on the other. Indicated price does not include ball end or adapter which can be found under Accessories. If you order Lockfast adapters the assumption is made that you want these fitted & pinned to the brush, unless instructions to the contrary are given on checkout. Diameter 8″ to 16″ – 0.055″ for a medium brush, 0.07″ for stiff. Diameter 18″ to 22″ – 0.07″ for a medium brush, 0.085″ for stiff. Diameter 24″ to 26″ – 0.85″ for a medium brush, 0.1″ for stiff. 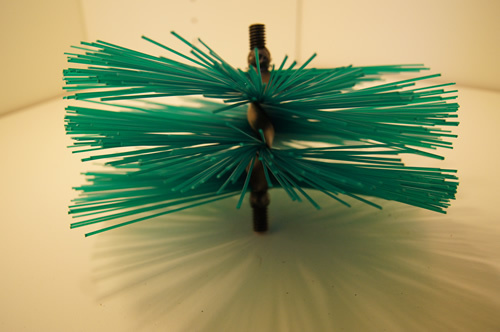 Diameter 28″ to 36″ – we recommend 0.1″ bristle. 7", 8", 9", 10", 12", 14", 16", 18", 20", 22", 24", 26", 28", 32", 36"
0.04", 0.055", 0.07", 0.085", 0.1"